The 4530 series RF Power and Voltage Meters offer high dynamic average and peak power measurements at frequencies from 9.9 kHz to 40 GHz. 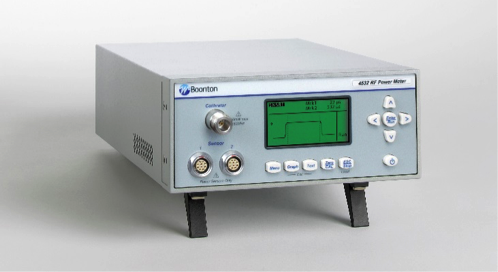 Boonton’s advanced 4530 Series RF power meters combine accuracy of a laboratory-grade instrument with capabilities required for production test. For measuring average power or peak power of EvDo, WCDMA, WIMAX, LTE or HDTV signals, Boonton’s single-channel (4531) and dual-channel (4532) models provide a wealth of powerful features. Besides peak power, average power, and voltage, the 4530 series perform statistical power analysis (CDF and PDF). It is compatible with a wide variety of Boonton RF power sensors and voltage probes. Sensor setup is easy and accurate: the instrument recognizes sensors and downloads calibration and setup data from the sensor automatically, as soon as they are connected to the instrument.